Info: Created on 2nd April 2011 . Last edited on 8th April 2011. Well, it's difficult. 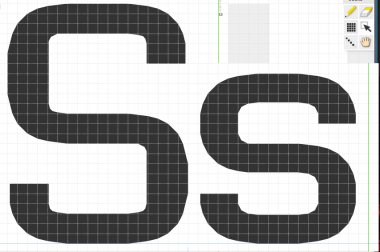 I picked this scale as being the best fit to get those subtle horizontal curves, but it's not quite fine enough to cope. Sigh. Making the caps more compact helps with the curve mismatch somewhat. Some of the cap curves remain problematical -- B, etc for instance. 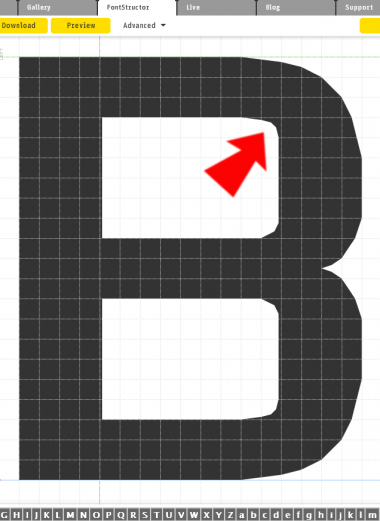 It would be nice to shave a bit more off the curve but of course I used the optimum brick shapes on the lower case, didn't I. Oooh Fontstruct, you're such a strict wench. The case of the gritty grid. This brings to mind the reason I abandoned fake curves in the first place. There's an optimum combination of angles, and that's all there is to it. The join between the horizontal or vertical plane and the first angle, no matter how shallow, tends to go klunk. Adding thousands of bricks to miniaturize the klunks hides them, but I know they're there!.